Cover letter example for a Assistant Accountant position. If you are interested in figures and calculations then this could be the career for you. An Assistant Account works to the Accountant of a practice or firm whilst learning and studying for professional Accounting qualifications. You must have a logical mind, be good at Maths and be able to work out figures quickly yet efficiently. You may work on client sites helping them with their books and accounting or work in practice helping Accountants on their work load. If you have found the job in which you want to apply for then the below covering letter may help you and give you a guide about your application. I have recently seen your advert for an Assistant Accountant and I would like to apply. I have always had a keen interest in Accounts and mathematical problems and would like to concentrate my career in this area and take my accountancy exams as required. I have had some experience so far working in an accounts department dealing with bank transactions for the company and doing reconciles petty cash and till float allocations. I am now seeking to continue my career and continue learning and I would really like to do a role like this. I am a very organised person and I pay great attention to detail in everything I do. I am very keen to learn on the job and through relevant exams and am eager to try different areas of specialism as required by the company. I have enclosed a copy of my up to date CV. If you are interested in my skills please do not hesitate to contact me and I will answer any questions you have. 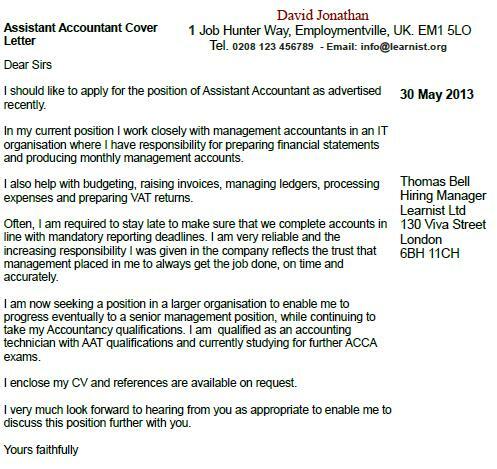 I would like to apply for the position of Assistant Accountant as advertised recently. In my current position I work closely with management accountants in an IT organisation where I have responsibility for preparing financial statements and producing monthly management accounts. I also help with budgeting, raising invoices, managing ledgers, processing expenses and preparing VAT returns. Often, I am required to stay late to make sure that we complete accounts in line with mandatory reporting deadlines. I am very reliable and the increasing responsibility I was given in the company reflects the trust that management placed in me to always get the job done, on time and accurately. I am now seeking a position in a larger organisation to enable me to progress eventually to a senior management position, while continuing to take my Accountancy qualifications. I am qualified as an accounting technician with AAT qualifications and currently studying for further ACCA exams. I enclose my CV and references are available on request. I very much look forward to hearing from you as appropriate to enable me to discuss this position further with you.